Update: Line, Mic, & Master Bus Captured. Vintage 1960's American console path. Discrete circuitry, with transformer character. *-20 & -18 calibration standards. TIP – Pair with the Vintage L Filter Set for console matched filter functionality. Each channel-strip consist of a very simple, single ended class A amplifier block for the mic preamp, with equalization in the feedback path. The input and output are both transformer isolated. These are the modules that M****y based their new production M****y/Langevin Dual Mono preamp upon. I’d suggest googling “Langevin AM4” to find some interesting information. The eq is 2 bands, high and low, each band with 3 selectable frequencies. The boost/cut controls are stepped, and have a peaking response in boost settings and a shelving response in the cuts. This eq’s simplicity and broad bandwidths give it a very smooth, natural sound. What it lacks in options it easily makes up for in sweetness. Very nice sounding eq. The amplifier has 4 selectable pad positions, 20 dB each, for up to 60 dB of pad prior to the input transformer. As a result this can accept both mic and line levels through the same single input. I’ve included separate “Line” and “Mic” Level captures. These inputs are essentially identical, except that the character/response is different do to the input level settings. Last edited by rhythminmind on Mon Feb 20, 2012 7:33 pm, edited 7 times in total. Well I think it will be some time before my next release. But I do have a pair of LILPEQr's that are just screaming to get sampled. In do time. rhythminmind wrote: Well I think it will be some time before my next release. Is this being sold as two seperate libraries, HF & LF? If so, what is in each? LF = Low freq. bell. This EQ sounds really good.Good pick Eric.The whole console deserve to be sampled! EDIT:It's a bell!Damn it not a shelf! Last edited by elam on Sat Nov 12, 2011 10:36 pm, edited 1 time in total. Last edited by rhythminmind on Sat Nov 12, 2011 10:09 pm, edited 1 time in total. LF = Low freq. Shelf. Would you have an interest in the channel preamp & master bus paths? Master bus with some stereo magic maybe? Thats do-able. I have access to the direct i/o of each section. 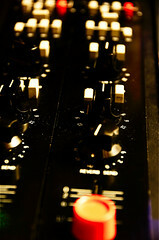 rhythminmind wrote: Would you have an interest in the channel preamp & master bus paths? Yes.Actually I only heard about this console before.That's the first time I'm able to have a bite of it.I like the flavor of your program,really.I just test the demo and I'm about to buy it "just" for the "pre" even if,I repeat,the EQ is great. So I was thinking that other sections of the desk might bring more of this flavor to the table. PS : It would be your "1st" console Eric!For the public I mean ... How's the master section,the pre,etc,sounds compared to the EQ ? rhythminmind wrote: Thats do-able. I have access to the direct i/o of each section. Please add some stereo magic like you did on the British program and the Enhancer program. Sounds very natural to me and it blows in a very nice way some air in the mix. Can do, It's not "magic" of my doing, it's the byproduct of sampling stereo pairs of hardware. You get natural stereo deviations. It's amazing sometimes how such a subtle thing brings life into a path. I am interested in the "rest" of this console. I think the EQ sounds great! Did someone mention NLA. I'll be back! rhythminmind wrote: It's amazing sometimes how such a subtle thing brings life into a path. As for sampling different parts of the AM-401 desk.Again yeah.If you think it worth it sound-wise,yeah.